Which Healthcare Speciality is Best for Your Personality Type? 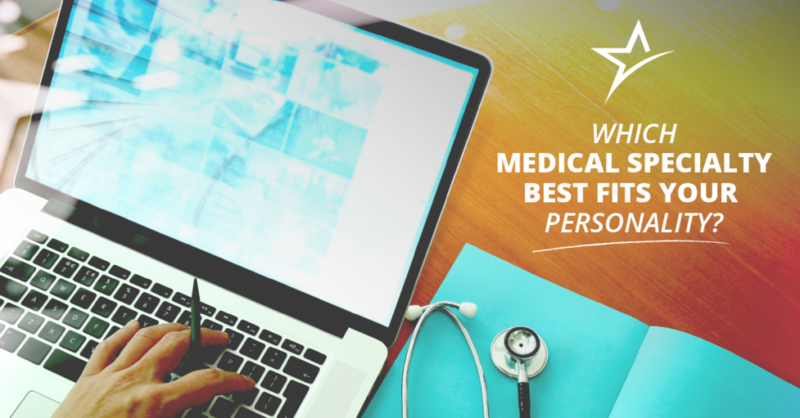 Which Medical Specialty Best Fits Your Personality? Let’s face it: We don’t all have the sunny personality of a morning people. We’re not all people persons. And we’re definitely not all patient people. Some folks simply prefer different jobs than others; owning a daycare might be a dream job for someone but a nightmare for someone else. And no one wants their kids to go to a daycare run by someone who doesn’t love kids. We may not all be able to make a living doing what we love, but some self-reflection can lead us to a career that’s well-suited to our personality, which certainly makes life a lot more pleasant! When we don’t like our job, we become stressed out, and our health and other relationships can suffer. You’ve decided to get into healthcare because you want to help people, among other reasons. Some personality traits, such as attention to detail and compassion, are useful in healthcare in general. A quick look at your personality, aversions, and preferences can point you in the direction: a satisfying healthcare career. Extraversion: indicates how outgoing and social you are. Agreeableness: measures your view of human nature and how well you get along. Conscientiousness: your tendency for methodical planning and perseverance. Neuroticism: your level of emotional stability and balance. Openness: a measure of your imagination and curiosity for new experiences. In general, we look for a 3 or more on most of these traits to be happy and successful in most branches of healthcare. A look at our fears and aversions can help us avoid a situation where we’re uncomfortable. And in healthcare, there are plenty of opportunities for people to be uncomfortable! Blood: A lot of people are afraid of blood, but if you’re looking at being a nurse or medical assistant, you’d better get over that fear quickly! Nurses and medical assistants draw blood for lab tests, and the injuries that these professionals deal with can be bloody. Needles: Medical professionals take many precautions to avoid accidental needle sticks, but many people are still afraid of them. Medical assistants and nurses are at the frontline again when it comes to administering treatment via needle, so if you’re considering either career path, you need to be comfortable with needles. Bodily fluids: It can be unpleasant, but someone has to change the Depends, and that someone is a nurse. Urine, feces, and sputum are all just part of the job; if that’s your intended career, be prepared deal with it. Conflict: Many of us do the silliest things to avoid conflict, but if you’re interested in becoming an occupational therapy assistant, you’d better be comfortable tackling issues head-on. The needs and interests of your patients may often be at odds. Being bitten: Occupational therapy assistants may find themselves with a combative patient and on the receiving end of some zealous teeth. You may also have to be around patients’ protective animals while administering occupational therapy treatment. To pursue this career, you need to be okay with that. Give some thought to the type of environment where you feel most comfortable. Ideally, you should be excited to be at work, so it’s important to enjoy the space and activity level around you. All healthcare tracks include each of these elements to a certain degree, but knowing yourself and your preferences go a long way toward making your job enjoyable. At Ameritech, our holistic programs of study consider our students as whole individuals. We educate healthcare professionals to thrive in their work environment. Visit our website to learn more about our nursing, occupational therapy assisting, medical assisting, and other programs.